> Hey, I don’t particularly search out for hotdogs or burgers as a means of staple when I am contemplating what to eat, but on this particular day, I get a tweet informing me that The Greasy Wiener gourmet food truck was going to be in Irvine and if interested, to go out there and give them a try. I gathered up my trusted fellow foodie and blogger Holly (Savored) and headed out to Central Park West where we found several trucks already parked there. I quickly searched out for The Greasy Wiener and found Adam, who had tweeted me and Holly as well to come on down to give their simple menu a shot. We chatted a little before embarking on what was to be a hell of a journey into making my taste buds whet and changing my mind forever on the humble hot dog and its counterpart, the burger — in this case, sliders. The menu is simple. There is the bacon chili cheese dog, or the chicken and apple sausage dog. Then there is the Iggy slider which come two to an order and topped with cheese, pickle and a special ‘secret’ sauce. If you’re a non-meat eater, well, they even have the “Hippie” which is a vegan dog especially for you. Add some fries, or, if you’re feeling REALLY brave, get the chili cheese fries. A whopping portion of fries topped with the delectable chili and cheese sauce for only $4 is enough for four or more people to share as a side. It was so good I couldn’t stop eating it even though I kept telling myself “gotta stop, gotta stop”, but I kept taking another bite. I tend to like menus which are simple and no fuss. Really, hot dogs, burgers and fries. Straight-forward stuff! But let me tell you, when the stuff hit my mouth, there was nothing simple about it. The bacon chili cheese dog was topped with a massive amount of grilled onions and some grilled jalapenos (I asked for mine spicy, you can get it without) making it a little difficult to bit into at first. I picked up the dog and thought about it for a bit before just giving up and taking a bite. I think I was literally a bit shocked at the mouth-explosion which happened right after I realized what had hit me. This wasn’t like any other hot dog I’ve ever had before and I thought those bacon-wrapped muthas from downtown LA were the bomb. These hot dogs are fried which adds to the snap of the sausage but they are not over-fried where the skin shows sign of deterioration and starts wrinkling up. Oh no, these were just fried to perfection and the incredible snap of each and every bite is what is so addicting for me. You see, there are two reasons why I eat hot dogs, one of course is the flavor of the sausage portion and the other, is how much it snaps. For some reason, that snap just thrills me to no end. I can’t explain it, but it does, and the dog here has the most incredible snap I’ve ever encountered. Next was the chicken apple sausage — okay, I’ve never been a fan of sausages mixed with apples to begin with due to its sweetness — I do NOT like sweet with my savory food — but I’ll have to give it to them because again, the snap factor had a lot to do with how I like a dog. If you like chicken apple sausages, definitely go for this one. Sliders, ahhh these cute lil miniature burgers which sound so adorable and tasty, but my experience with them have been a hit and miss. Why? Well, most places use King’s Hawaiian bread rolls for their sliders and if you were paying attention …. yeah, you get the picture, they’re SWEET! Up to now, my favorite sliders are those kobe ones from Drago Centro in downtown LA, but these little suckers just blew my mind. Take freshly ground Angus and season them correctly, cooked so they are still tender and juicy, and now you assemble them with grilled onions, a fair amount of cheese, and the ‘special’ sauce and voila — positively one of the best sliders I’ve had in a long time!! 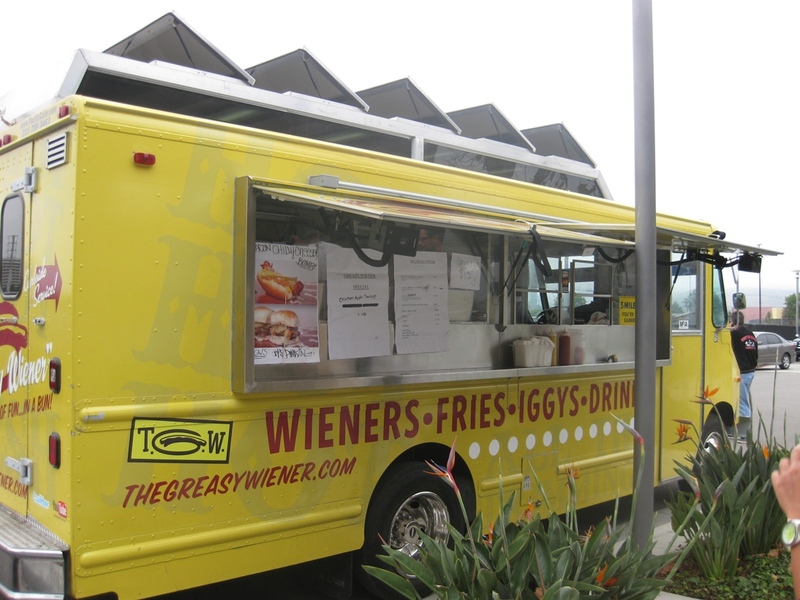 At the moment, The Greasy Wiener operates in Los Angeles and if you’re lucky they’ll stop by in OC on a whim. They are working to get an OC permit and when that happens, I’ll be first in line for more of this deliciously greasy fare. > I’m convinced that newly opened restaurants get the “new restaurant hype” and the long lines outside the place affirms that hype even more. This is what happened to Liang’s Kitchen, newly opened in Orange Tree Square Irvine, taking over the Takaraya space in the Ranch 99 Market plaza off Walnut. We tried to go there several times in the past few weeks and each time, we drove by there and the crowd outside was insane, so I opted out. I do not like standing in line for food, it puts me in a bad mood and makes my dining experience very unpleasant. This time, we got there early and stood in line at around 10.50am (they open at 11am) and there were only a few parties waiting, Believe it or not, they put out a “sign in sheet” and make you put yourself on a “waiting list” and this is BEFORE they even open. Of course the minute the sign in sheet was placed outside, those who were in line behind us descended upon it like vultures trying to get in on the game. This is the reason why I hate eating in Chinese establishments around Irvine. People are rude and do not follow protocol. It is a highly stressful experience when you feel like you have to fight others just to get fed. At 11am sharp, a guy comes to the door and reads off from the ‘waiting list’ and customers are seated. Menus are already on the table so the intention is for you to quickly order, so they can quickly feed you, so you can quickly get the hell out of there so they can keep the momentum going. The menu is reminiscent of that from A&J, Nice Time Deli and even Yu’s Garden. 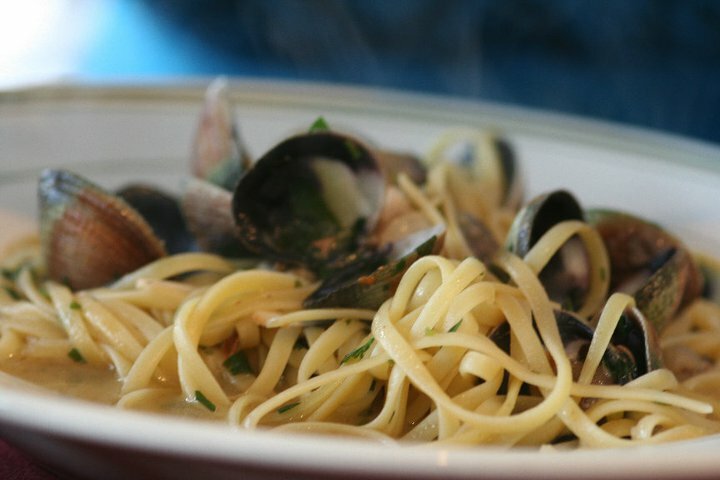 An order sheet is provided as well as a menu with tons of photos to help you along the way. I’m a huge fan of tendon and beef noodle soup and although I like the one at A&J it’s not the best I’ve ever had. I was really hoping that the one here would be good. Sadly, it wasn’t and to add insult to injury, the whole thing tasted rancid from the broth to the tendon. 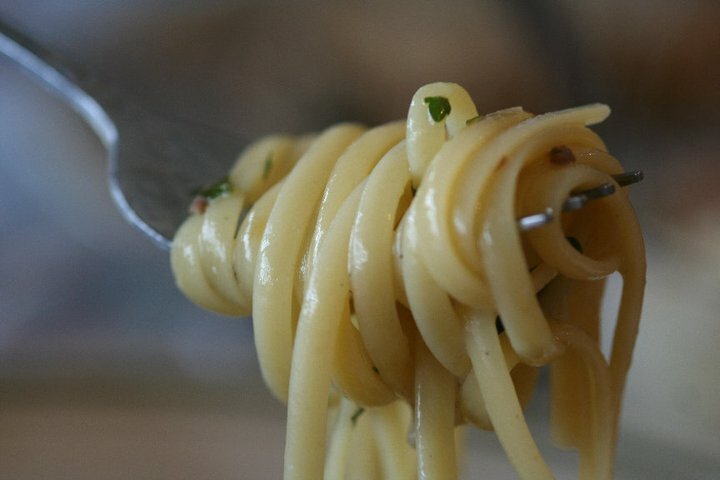 It made my son and I gag and when that happened, no one else wanted to try it. Scallion pancakes (cong you bing) is my son’s favorite item whenever we go to Chinese/Taiwanese breakfast but ironically, the ones here didn’t impress him at all. He ate one piece and didn’t touch it again. The pancake was undercooked, very greasy and was chewy instead of crispy on the outside. To make matters worse, the beef roll we ordered was wrapped with the same undercooked scallion pancake making it extremely soggy. When I took a bite, the grease oozed out from the scallion pancake — this is due to the pancake not being cooked at the right temperature and left to sit in the oil in low temperature. Dan dan noodles (spicy sesame noodles) was terribly weak. The sauce was watery, lacked flavor and basically, consisted of nothing but just the sauce, a pinch of chopped scallions and such a small amount of crushed peanuts that it didn’t do anything to enhance the flavor. I love bittermelon so I ordered the stewed bittermelon and was glad the flavor was nice and was soaked into the melon, but the seeds weren’t removed so the initial bite caught me off guard and I bit into a bunch of seeds which made the whole eating experience very tedious. Fried pork chop bento was probably the best thing we had. The pork chop was nicely fried, even the ground pork on the rice was nicely flavored, but when I took a bite of the pickled vegetables, they tasted weird…. and I realized they were OFF. I quickly removed them from the plate and prayed that I wouldn’t get sick from this AND the rancid beef noodle soup. If the food had been good, I wouldn’t have had a problem paying what we did for this meal. However, I don’t believe in paying for bad food, whether it’s a lot or a little. There is no excuse for serving bad food to customers, let alone rancid food. The lines outside this place do not justify the quality you will receive and frankly I think it’s just that Liang’s Kitchen is new and people are curious that the line is so long. 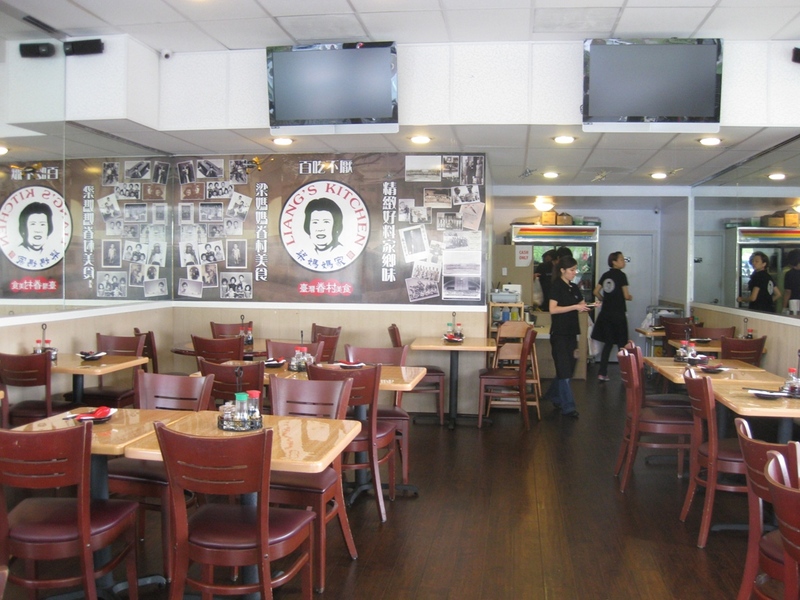 Once the hype dies down and everyone goes back to this being just another restaurant in Irvine, Liang’s Kitchen will have trouble staying so popular if it continues to serve its customers such crappy food. Xanh Bistro is tucked in the corner of a larger strip mall with no signage to alert you to it from the street, so if you’re not looking for it, you won’t find it. But let me tell you that this is a gem of a restaurant you definitely need to go in search of because you won’t regret it. The food here can be construed as modern Vietnamese, but the only thing modern here is the presentation and attention to detail that Chef Haley Nguyen puts into every dish that hits your table. 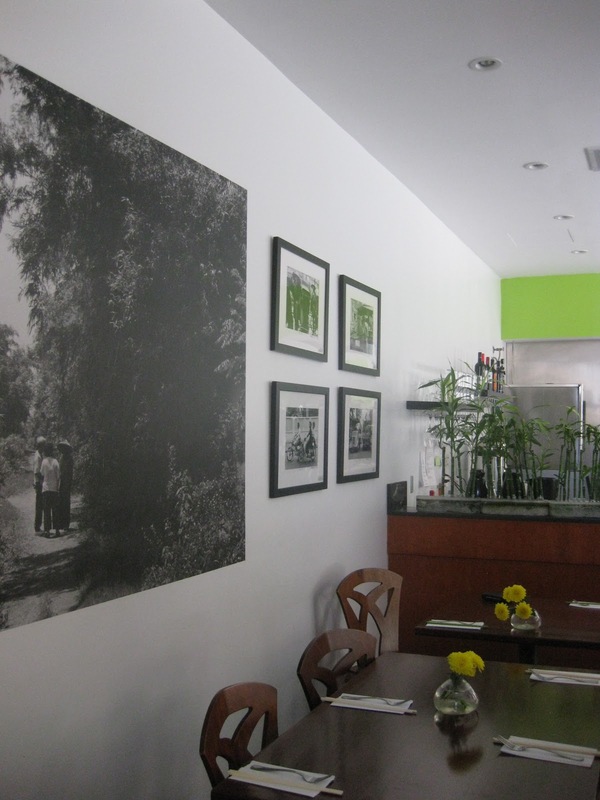 The food itself is as traditional and authentic as one can find in lil Saigon but your food won’t be carelessly dumped on your table, nor would the staff treat you with nonchalant disrespect. 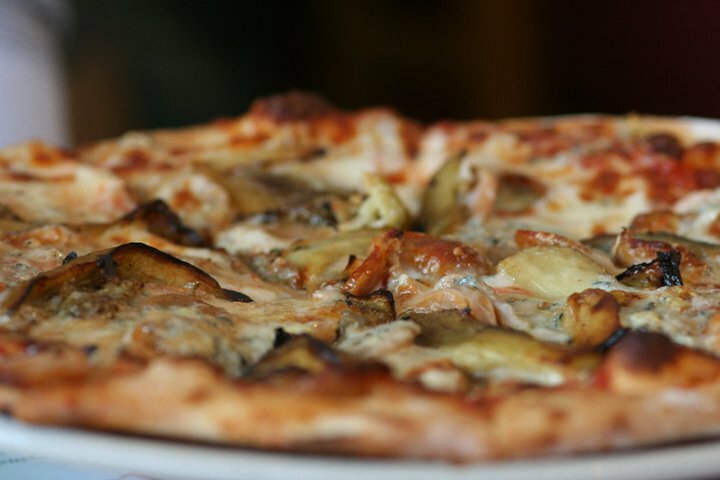 Here the service and food go hand in hand to give you a complete experience. Chef Nguyen will be the first to tell you that Vietnamese food requires a lot of preparation but the end result is well worth it. Nguyen also runs cooking classes which teaches eager students easy ways to prepare Vietnamese meals at home (check out the website for more information). Refreshing salads are very popular in Vietnamese cuisine and almost every restaurant will offer some sort of salad on its menu. 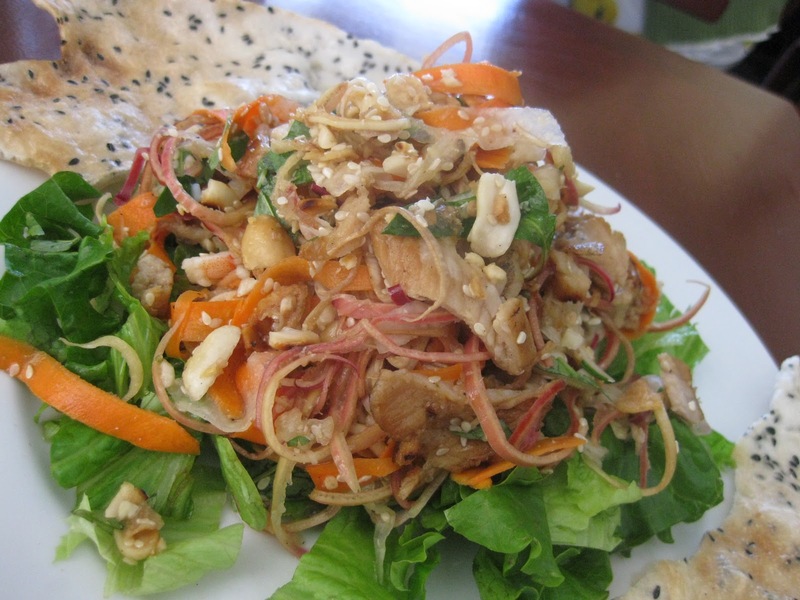 Goi Hua Chuoi, or banana blossom salad is one such salad. Banana blossoms are found on the condiment plate when you eat bun bo hue, a beef noodle soup from Hue, the old capital city of imperial Vietnam, and have a nice crunch to it, which makes it ideal in a salad. Here, Nguyen adds pickled daikon and carrots, Vietnamese mint, peanuts, sesame seeds, shrimp and grilled pork. All the ingredients tossed in a dressing made with nuoc mam, or fish sauce, it is the perfect way to tease and whet your palate for whatever else to come. 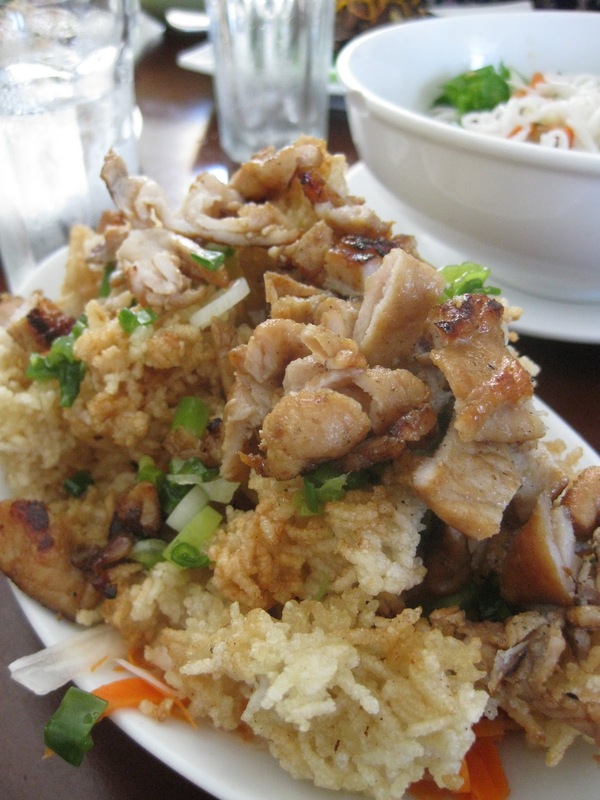 Com Chay Thit Nuong is an appetizer comprising of crispy rice and grilled pork. Chunks of jasmine rice, deep fried until crispy is topped with pieces of flavorful grilled pork to give this dish not only great flavor, but also, great texture. Crispy rice is always delicious regardless of what cuisine it comes from, whether the bottom of a Korean bibimbap pot, part of Chinese sizzling rice soup, or this, I love it all. This appetizer is definitely something I would order over and over again! 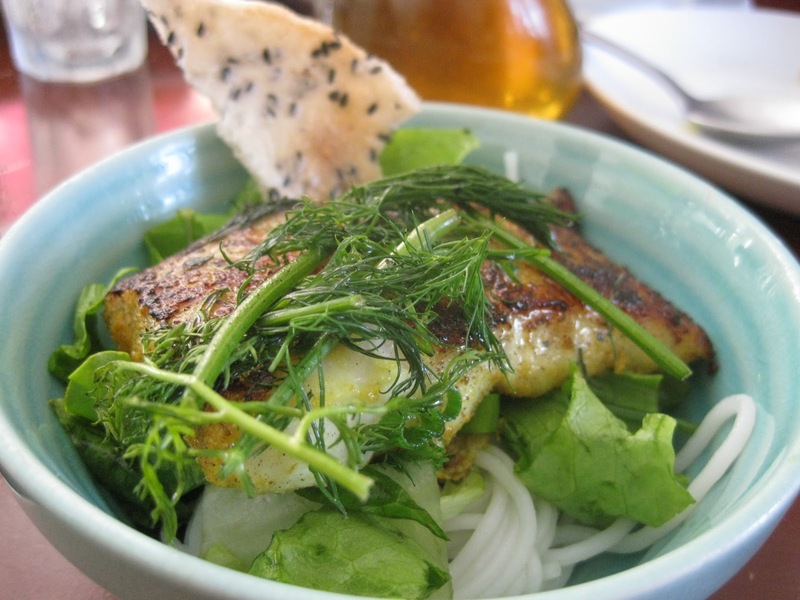 One of my favorite Vietnamese dishes is Cha Ca Thanh Long, dill fish. I’ve had it in so many restaurants in lil Saigon….. usually whitefish is preferred ranging from catfish to snapper, but the best ones are seasoned impeccably and cooked to perfection, moist and flaky. The fresh dill brings an added dimension to the dish and is the primary factor in the wondrous aromatic finish of the fish. Bun, or rice vermicelli, along with lettuce, peanuts and special black sesame crackers are served alongside this dish to be assembled before eating. A bowl of special shrimp paste sauce is served alongside for dousing purposes. Although the one at Xanh isn’t pungent enough for my tastes, it will be accepted by the majority of people because it is mild yet flavorful enough to enhance the ingredients. I also got to sample the Bo Ham Ngu Vi — five-spice braised short ribs — which reminded so much of a dish my mother makes. It was not surprising then when I found out that this dish has its roots from Chinese cuisine and although Nguyen’s version isn’t as intense as my mother’s, it was beautifully paired with garlic mustard greens. The meat was tender and it was obvious it had been slow cooked for hours. Chef Nguyen also makes her own ice cream in-house so if you have room, by all means try the ginger ice cream! It is delicious! There were so many other enticing dishes on the menu I had wanted to try, but unfortunately, there is only so much my stomach can endure in one sitting. I am already eagerly anticipating my next visit and I am planning on bringing along some friends so we can order more dishes to share. I wasn’t sure what exactly Komodo was offering really — is it Mexican? Indonesian? Singaporean? I guess there is a little of each. What caught my eye was the Indonesian offering of beef rendang in a taco. I make a mean beef rendang, or so I’ve been told, by my Indonesian friends and my Indonesian BFF’s mother no less, so I know what I’m talking about. I wanted to try it in a taco because in my mind, this would TOTALLY work, and with a cucumber salad? It could totally rock!! I was waiting for my friends to arrive, but I was absolutely famished so I don’t pass out while waiting. I get the taco, it looks good enough, but when I looked at how pale the rendang is I knew that flavor-wise, it wasn’t going to be strong enough. I also didn’t catch the fragrant aroma it should’ve been emitting. I took a bite and surely, there was just a hint of the rendang flavors, but boy oh boy, it should’ve been pounding out at least 10x more than what I was tasting. I liked how they even topped it with bawang goreng (fried crispy shallots), but the rendang need a hell of a lot more punch than that! There wasn’t enough sauce so the meat was a little dry — there is a lot of potential here, but right now it wasn’t doing it for me. When my friends arrived, we also got the Komodo taco — seared skirt steak with jalapeno aioli and a Southwestern corn salad. It looked very colorful and appetizing and honestly, the corn salad was really good, but the steak was so dry (almost like jerky) that none of us wanted to eat the meat after tasting it. The other thing we tried were the meatballs with romesco sauce, which is a Spanish pepper sauce. The pork meatballs were overcooked — the outside was too brown and the entire meatball was well….. dry! The romesco sauce was perhaps a variation of traditional romesco sauce because it didn’t taste like any romesco sauce I’ve ever tasted before. On the whole, this was another item none of my party enjoyed. I may give Komodo another try sometime later — but for now, I’m kinda licking my wounds from wasted stomach space. > When my friends were in town I came to visit and hang and ended up having breakfast at the hotel. 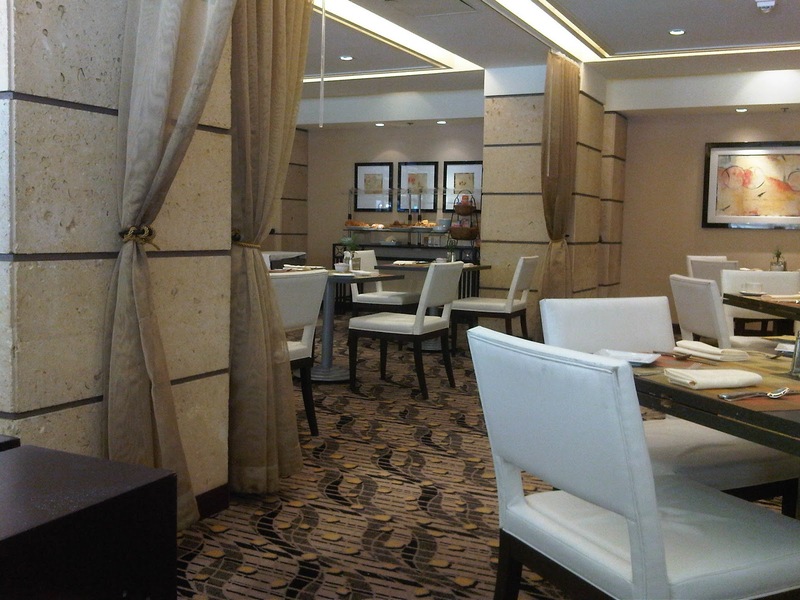 The Californian at the Sheraton Universal Hotel is small but suffices in that most people who stay here are on vacation either to visit Universal Studios or something like that and wouldn’t ordinarily be eating inside the hotel anyway. 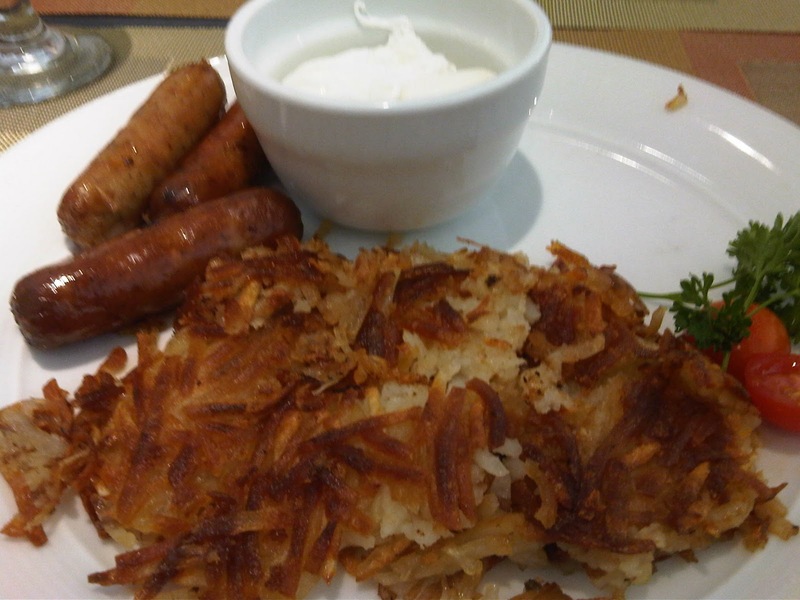 There is a breakfast buffet for $21 but I opted for the regular breakfast of sausage, poached eggs, hash browns and toast. It was $12 which wasn’t exorbitant for hotel prices and one would expect to pay a few bucks less at a reasonably nice breakfast place. All I cared about was that the poached eggs were poached well and that the sausages were flavorful — which they both were. The poached eggs could’ve been a little less well-done, but they still were runny. The sausages were lovely pork sausages, very tasty! I had asked for the hash browns to be extra crispy and they did exactly that! Overall, a nice meal without really breaking the bank if one absolutely MUST stay in.